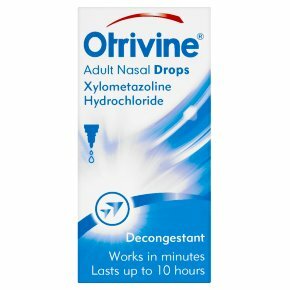 Xylometazoline Hydrochloride Decongestant Otrivine® Adult Nasal Drops is an effective decongestant which acts gently to clear a blocked nose within minutes and relieve excessive nasal secretions for up to ten hours. Useful for colds, hay fever and sinusitis. Otrivine Nasal Spray helps unblock your nose in 2 minutes, and lasts for up to 10 hours. Offers relief from: nasal congestion (blocked nose, including colds), perennial and allergic rhinitis and sinusitis. It helps to open up and clear the nasal passages.Otrivine Adult Nasal Drops are for application in the nose to give relief from: nasal congestion (blocked nose, including colds), perennial and allergic rhinitis (recurring inflammation of the nasal mucous membranes, including hay fever) and sinusitis. Otrivine Adult Nasal Drops contain the active ingredient xylometazoline hydrochloride which helps to open up and clear the nasal passages by reducing the excessive nasal secretions and reduces swollen blood vessels to their normal size. Otrivine Nasal Spray helps unblock your nose in 2 minutes, and lasts for up to 10 hours. Dosage: Adults and elderly (all indications): 2 or 3 drops in each nostril 2 or 3 times daily. The drops are suitable for children over 12 years of age. Route of administration: Nasal use. Do not use for more than 7 consecutive days. Otrivine Adult Nasal Drops contains xylometazoline hydrochloride. Always read the label. Directions: For full instructions see enclosed leaflet Dosage for Adults and Children over 12 years: 2 or 3 drops of solution in each nostril 2 or 3 times daily. For reasons of hygiene do not use this bottle more than 28 days after first opening it. Each Otrivine pack should be used by one person only to prevent any cross infection Protect from heat. Do not use after the expiry date given. Not suitable for infants or children under 12 years.<br><br>Keep all medicines out of the reach and sight of children.<br><br>If you are pregnant or taking other medicines or are under a doctor's care consult your doctor before using Otrivine.<br><br>Do not use continuously for more than seven consecutive days.<br>If symptoms persist consult your doctor.<br><br>Warning: Do not exceed the stated dose.<br><br>Sealed cap. Do not use if seal is absent or broken.